Fungus hyphae are abundantly found in the Lower Devonian chert from Rhynie, which is famous for fossil land plants. Probably the hyphae represent several fungus species, judging from the variety of apparences. The below pictures have been specially selected for uncommon details. Often the hyphae form confusing tangles or frameworks whose components are more or less straight, eventually of differing thickness (Fig.1). Less often they are distinctly curved as in Figs.2,3. Figs. 1-3: Fungus hyphae of different aspect in Rhynie chert. Width of the frames 2.5mm, 1mm, 2.5mm. Fig.4: Conspicuously straight fungus hyphae coated with chalzedony and quartz topping. Width 5.5mm. These fungi throve in water, hence they have to be distinguished from those which grew within plant matter, dead or alive, also preserved in the Rhynie chert. 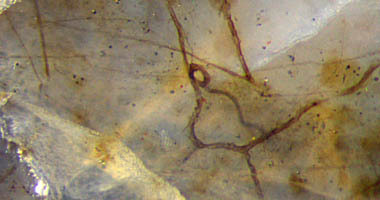 The water including the hyphae may have turned into silica gel and later into chalcedony as a whole. Apparently with lower supersaturation of the silica solution, the hyphae became coated, with water left in between. Eventually the supersaturation was so low that quartz crystals instead of chalzedony grew on the outside of the coatings. 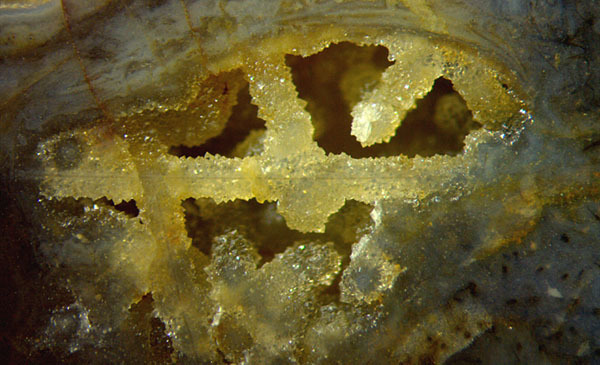 Obviously, silica deposition stopped permanently for some reason at some time so that a cavity was left, which is still there now, with coated hyphae suspended between the walls, as in Fig.4. Cavities crossed with coated hyphae are not abundant, and what is seen in Fig.4 is the realisation of an unbelievably small chance. 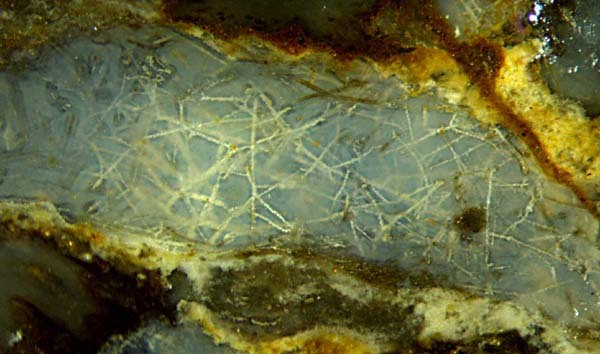 Unawares of the presence of such cavity in the chert sample, the cut incidentally has gone right along an unusually long straight coated hypha. Furthermore, the cut plane is so close to the hypha that part of the quartz coating has been cut away and the hypha is dimly seen through. Visual inspection reveals a straight hypha with a length of more than 300 times its diameter. How could the fungus possibly have kept to the once chosen direction with such accuracy, and for what purpose ? Judging from the hyphae seen running in any direction, there is no pre-set favourite direction which could have served as guidance. 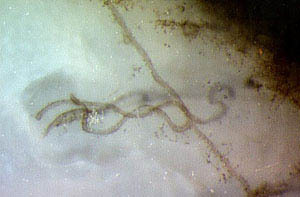 The idea that the cavity with hyphae might have been stretched horizontally while the whole was still soft must be excluded because, incidentally again, there is another straight hypha seen in Fig.4: It is on the left half of the picture, shorter than and running across the horizontal one. As a possible explanation, the hypha could have stuck to two fixed points, then contracted, thus pulling itself straight. It has to be found out whether or not this is compatible with hypha frameworks as in Fig.1.